who received nine votes, Alliyah Edwards, who received four votes, Yusuf Fattah and Youssef Afifi who received one vote each. “I was going to retire SG and focus on graduating, but as cheesy as it sounds, I felt like I had to stay,” Nazir said. “I want to be able to change the environment because there are so many issues that I want to address.” Nazir said some of these changes include bringing back the live streaming software for Senate meetings as well as updating the SG website. to be that inspiration for women so that they can be in leadership roles like this.” In terms of her plans for the position, Nazir created what she called a “three-phase plan,” to guide senators during the 60th term. Her goal is to provide a structure where senators are held accountable and are aware of what is to be expected. The tiers are titled: Making Senate work for you, strengthening Senate and campus coalition plan. The Oracle is published Monday and Thursday during the fall and spring semesters, and once weekly, Wednesday, during the summer. 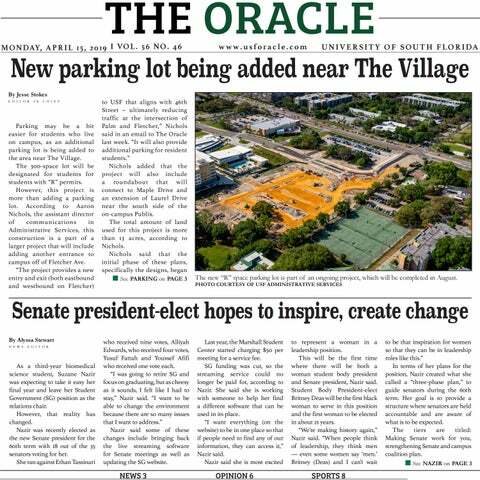 The Oracle allocates one free issue to each student. Additional copies are $.50 each and available at the Oracle office (SVC 0002). BY PHONE Editor . . . . . . . . . . . . . . . . . News ................. Advertising . . . . . . . . . . . . Classified . . . . . . . . . . . . . .
CORRECTIONS The Oracle will correct or clarify factual errors. Contact Editor in Chief Jesse Stokes at 974-5190.
in early 2016 and will be complete in August for the start of the fall semester. Anthony Gifford, a former Summit resident, said that he used to spend a lot of time finding a parking space. Now, with these additions, he said that he believes parking will be a simpler process for students who live on campus. “I would park across from the credit union parking lot too,” Gifford said. “I feel that increase space allocated for parking will help decrease the time spent parking.” Ashley Paytas is a Holly A resident who said parking is a “pain,” in part because she feels residents of The Village take some of the spaces in the Cresent Hill garage and in Lot 17 -- near Argos Exchange -- where she most often parks. “More parking would help because spatially USF just expected everyone in The Village to migrate and take up room in other parking,” Patas said. The Board of Trustees first approved an initial budgetary amount of roughly $6 million for this project in May of 2018, though the university only funds approximately half of this amount. The other portion which amounts to $3,275,000 is funded by the developers of The Village, CapstoneHarrison Street, LLC. All aspects of the project have been funded, with the exception of the roundabout near Maple Drive, according to Nichols. Alex Kahn, a senior majoring in communication, commented that he thinks more than an additional lot will be needed to improve congestion and trouble finding a parking space. “Why not a garage? We need more parking, and it’s more space efficient at solving the problem at hand,” Kahn said. Patricia Vega, a junior majoring in international studies, shared a similar sentiment. She parks in the park and ride lots with her “Y” permit, but because of where they are located it takes her a while to get to her destination. Nichols said that the project includes five points that he believes will be improved following its completion. Of those, is reducing the congestion that high-traffic areas often face, specifically at the intersection of Palm Drive and Fletcher Ave. It will create more accessible parking spaces with closer proximity to the residence halls for students who live on campus, will improve spaces for those riding in bike lanes and pedestrian walkways and improve access to Publix, The FIT and The Hub. “(The project will aid in) enhancing the university experience with well-designed, updated infrastructure -- the project includes upgraded sewer piping and a lift station, roadway and parking lot lighting, sidewalks and landscaping,” Nichols said. Additional reporting by Leda Alvim. Suzane Nazir will serve as the next Senate president for its 60th term. PHOTO COURTESY OF SUZANE NAZIR conducting two town halls — in the fall and spring semesters — with SG and students. “Over the past couple years, we had some issues with transparency where students don’t understand what SG does,” Martinez said. “It’s important for students to know what we actually do and what we can do for them.” As the current finance chair, Martinez said he wanted this position to create a more personable connection with senators. “You have less hard power but you more so advance the initiatives of the other senators which is what I care about now,” Martinez said. hit North Florida. The national conversation quickly switched to the devastating wildfires in California and it seems as though many members of Congress forgot about the issues of the panhandle. Much of the conversation around disaster relief in Washington has surrounded the allocation of funds sent to Puerto Rico and President Donald Trump’s petty squabbles concerning Puerto Rican leaders. These factors have led to inaction on the part of the federal government and the Floridian people are the ones that are currently suffering for it. North Florida is demanding action be taken and the country would be wise to listen to them. Jared Sellick is a junior majoring in political science. Initiative last year allowed us to grow our clinical staff and expand services, resulting in our ability to see 15 percent more students this academic year as compared to 201718. The Counseling Center welcomes input from students regarding services we could provide that would enhance our ability to meet the mental health needs of students. Each semester, we solicit feedback from students using our services, with 90 percent of clients reporting that they would use our services again and recommend our services to their friends. We have made changes to services and operations as a result of this data that have allowed us to offer continuous access to highquality mental health services, even during the busiest times of the semester. We look forward to meeting with Gromalski and Paytas, hearing their ideas, and seeing how we can best work together. USF cares deeply about the emotional and mental health of our students and understands that students succeed academically when their physical, mental and emotional wellness is at its best. The mental health services provided through the Counseling Center bear this out – fully 75 percent of our clients indicate that our services have assisted with their persistence and graduation from USF – and we plan to continue this vital role with the help of input from students like Gromalski and Paytas. Scott Stader is the director of the USF Counseling Center. 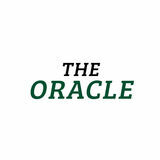 Letters to the Editor are published at the discretion of The Oracle’s Editorial Board. Letters should not exceed 400 words and should include a name and title or major. All letters are subject to editing for content, grammar and length. Submit Letters to the Editor to oracleeditor@gmail.com. in perspective — it was just a scrimmage between players who have been going against each other all spring long. How will the offense respond to a defense it doesn’t know almost everything about? Similarly, how will the defense respond to an offense it doesn’t know almost everything about? More optimistically, what didn’t we see from Brian JeanMary’s “vanilla,” in his words, defense Saturday? What more can we expect to see from Bell’s offense once it’s fully installed by the start of the season? Nobody left Corbett Stadium with their heads hanging, which is more than can be said about Dec. 20’s Gasparilla Bowl. But nobody was ever going to leave the spring game like that anyway. Bring on summer and fall camps, then bring on Wisconsin. Tuesday, April 16, 2019 Lunch and Learn - 11 a.m. to 1 p.m. Information Session - 6 p.m. The ASN and BSN programs offered in Florida are approved by the Florida Board of Nursing. The Associate of Science in Nursing (ASN), Bachelor of Science in Nursing (BSN), and Master of Science in Nursing (MSN) Family Nurse Practitioner (FNP) programs at the Tampa site are candidates for accreditation by the Accreditation Commission for Education in Nursing. ACEN, may be contacted at 3343 Peachtree Rd NE, Suite 850, Atlanta, GA 30326 or call 404-975-5000 or visit www.acenursing.org. All sites where nursing programs are located have received approval from the Southern Association of Colleges and Schools Commission on Colleges (SACSCOC). Lincoln Memorial University is accredited by the Southern Association of Colleges and Schools Commission on Colleges to award associate, baccalaureate, masters, specialist and doctorate degrees. Contact the Southern Association of Colleges and Schools Commission on Colleges at 1866 Southern Lane, Decatur, Georgia 30033-4097 or call 404-679-4500 for questions about the accreditation of Lincoln Memorial University. Lincoln Memorial University’s extended learning site in Tampa Florida, is located at: 3102 East 138th Avenue, Tampa, FL 33613. This site is licensed by the Florida Commission for Independent Education, License No. 5738. Additional information regarding this institution may be obtained by contacting the Commission at 325 West Gaines Street, Suite 1414, Tallahassee, FL 32399-0400, toll-free telephone number (888)224-6684.
lot of my friends go to UCF. And to come in here, kind of in my hometown, and to say like, ‘Hey, I’m doing good. I did it’ is super exciting for me.” Combined with her start against Florida on Wednesday, coach Ken Eriksen said Corrick had a pretty good week. “If you think about it,  innings with one run scored against Florida and UCF, so that’s a pretty good week in anybody’s book,” Eriksen said. “She’s a guy that’s going to give you an opportunity every time against anybody in the country to succeed. And she was tired [Sunday]. And she was just a bulldog.” Corrick’s performance Friday matched the USF record for innings pitched in a single game. The only other Bulls to pitch as many innings in a single game are now in the USF Hall of Fame — Sara Nevins (2013 vs. DePaul) and Monica Triner (1999 vs. Maryland). USF football held its annual spring game at Corbett Stadium on Saturday. Divided into offense vs. defense for the second straight year, the white team (offense) defeated the green team (defense) 73-36. Here are some takeaways from the Bulls’ 15th and final spring practice. An Early Statement The clock at Corbett Stadium read 1st Quarter — 15:00. Join us for our shred-a-thon to shred your unwanted paper documents for FREE !!!! We will have a shredding truck on site to destroy your documents. See website for a list of acceptable items & more details. ANY OIL CHANGE Some restrictions apply. See store for details. Not valid with eet discounts. Limit one coupon per vehicle. Coupon must be presented at time of service and may not be combined with other banner, coupon or discounted offers. Expires 06/30/2019.